Ben Fleskes from Portland (Oregon, USA) begun 2004 to produce LEGO compatible plastic train wheels. During these days from LEGO only standard wheels were available which didn't work well to build a steam engine. By now he offers 4 different sizes in 8 different colours. 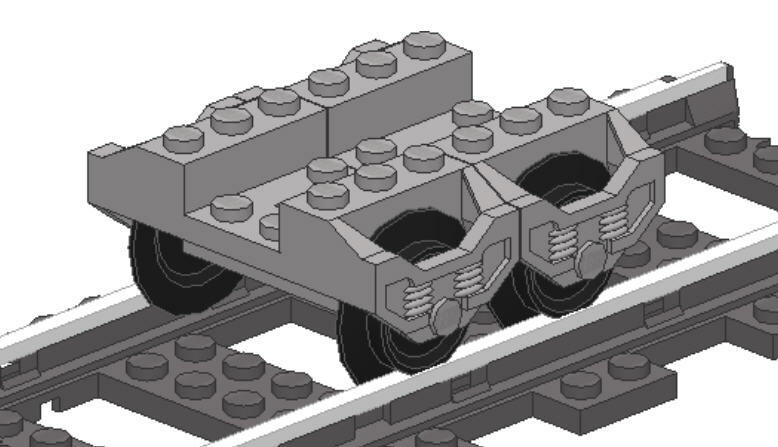 Even if LEGO offers some train wheels now, BBB's variety is unbeatable. Except of the small/standard size all train wheels are also offered as so called "blind drivers", train wheels without rims. These dummy wheels are needed if you build a long section of train wheels which should be able to run on curved LEGO train track. The BBB wheels have a LEGO Technic axle hole in the middle and it's geometry fits perfectly to the LEGO system. If you use a self build PowerFunction drive train you can power your engine right throught these train wheels. This concept was used in my models of BR 23 and BR 80. The aluminium rims are a non LEGO product and were designed and produced by LEGO fan Stefan Vorst. This solution allowed to built steam engines long before BigBenBricks offered his train wheels. 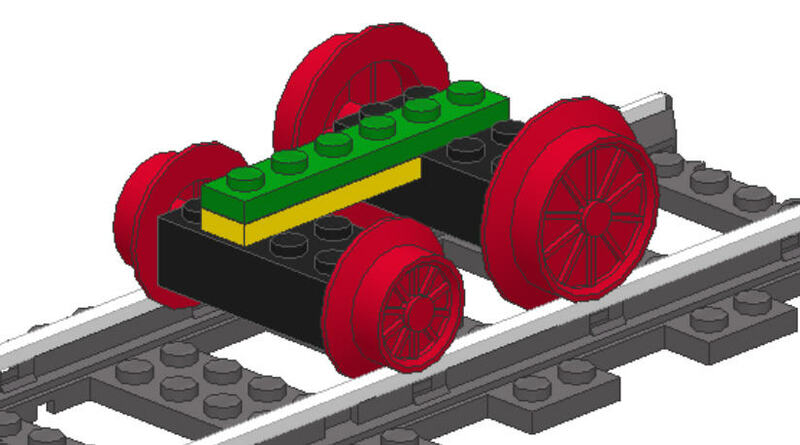 The spoked wheels can not be powered directly so you have to use standard LEGO train motors which could be place in the tender or a waggon of the train. This concept is realised in my Riviera Express model. In 2009 a long term dream became reality when LEGO offered the first large train wheels for steam engines with the fantastic Emerald Night #10194 train set. First the wheels were available in black, a year later they appeared in red in Toy Story Western Train #7597. The size of these LEGO train wheels equals the "large" size of BBB's wheels. 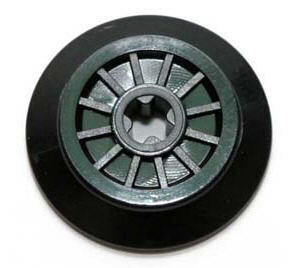 LEGO offers this wheel as standard wheel and as blind drivers. These wheels also use a Technic axle hole to fit in a Technic axle. The wheels shows a little gap to hold a rubber band. This rubber band prevent the wheels from spinning and the engine becomes more friction. If you use a self build PowerFunction drive train you can power your engine right throught these train wheels. This concept was used in my models Be 6/8 Swiss Crocodile and PowerFunction Big Boy. 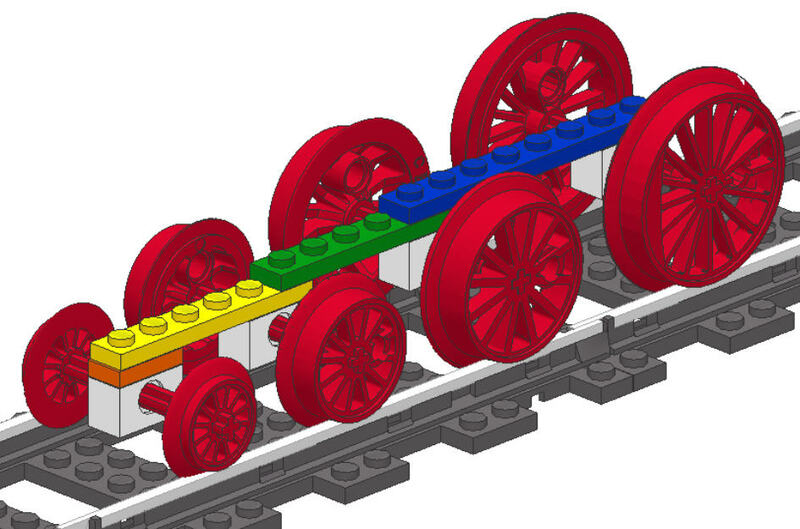 A new train wheel in standard size completes the train wheels LEGO offers. This wheel also has a Technic axle hole. This type of wheel is also available in black and red. This wheel is also used with the latest generation of train motors #8866 and #88002, therefore it holds a little rubber band to provide enough friction while running the train. This 9V train wheels from LEGO was produced as a pre-assembled unit for a long time in the 90's and early 2000's. Since 2006 all elements are offered separatly any it is up to you to fit everything together. The wheel holder is mainly available in black but was also produced in grey and light bluish grey for some sets. The wheels themself are only available in black. These wheels are the best ones in terms of running characteristics and came to market in 1991 with the new 9V train system. But these wheels are not suitable to build steam engine. The size of these LEGO train wheels equals the "small" size of BBB's wheels and the new small LEGO train wheels with Technic axle hole. As old LEGO train wheels I classify roughly every type of train wheel being produced before 1991. These wheels were connected to a modified 2x4 brick and their running characteristics are much worse then the 9V train wheels. These wheels were available in various shapes but only in the standard size. The colour was mainly red. While introducing the grey 12V train system in 1980 the colour of the wheels changed to black and the wheels now were fixed to the modified 2x4 brick. (But you might remove these wheels with some force.) 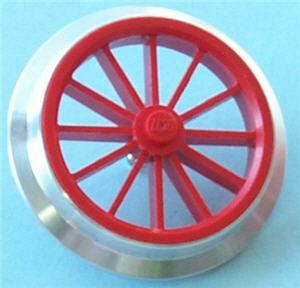 Some sets from the grey 12V era offered this train wheel also with red wheels. A speciality is the large train wheel from this era with 29 mm diameter (today this equals the "medium" size of BBB wheels). This large train wheel was only used in the famous steam engine set #7750. In addition it was sold as service pack. Before Ben Fleskes started to produce his BBB train wheels, this was the only and very expensive method to add some more steam engine realism to LEGO train models. 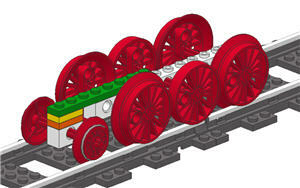 A good overview on LEGO train wheels can be found at www.bricklink.com.